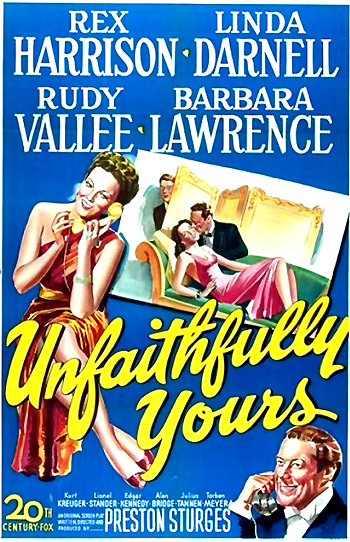 Unfaithfully Yours (1948) is a wonderfully stylish and witty fantasy-screwball comedy, with a non-linear story line, from director-producer-writer Preston Sturges - it was the last of his Hollywood films. The black comedy was unsuccessful at the time of its release, possibly due to the scandalous circumstances surrounding the suicide of star Rex Harrison's lover - troubled actress Carole Landis, when he refused to get a divorce and marry her. The funny comedy was remade in 1984, also unsuccessfully, with Dudley Moore in the lead role. While the plans work perfectly in his mind, he stumbles and bumbles his way through the preparations in real life to murder Daphne (the first scenario) with a complicated recording device. At last, realizing how deliriously silly and irrational he has been, he cheerfully embraces and kisses his loving wife, who has never been unfaithful, and is unaware of his plotting. A thousand poets dreamed a thousand years. Then you were born, my love.